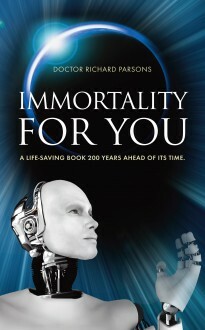 Immortality for You is the only book to put forward a treatment or ‘cure’ for old age. The book explains how to become ‘undead’ and immortal, giving details of how to perpetuate life in a post-resurrection future. Fascinating topics such as time travel, space flight and robotics are treated. The book explains the public’s achievements they may not be aware of, in technology and morality. Immortality for You is a life-saving book 200 years ahead of its time. Richard Parsons was born April 1964 under the name Richard John Summers. He was a pupil of West Hatch High School. At the age of 16 he had a job as an assistant printer. He left printing for an occupation as an inventor. Then in 1986 he departed from technology for various religious studies and certificates, returning to technology in 1993. After making several failed technological ventures, he wrote the book Immortality for You.